Home / How clean is clean? An infection can begin with a light switch. 3M™ Clean-Trace™ Luminometer is a simple, quick and reliable hand held diagnostic tool to verify cleaning effectiveness and capture, store and manage data for later analysis. 3M™ Clean-Trace™ Hygiene Monitoring and Management System offers food safety professionals a complete system of products consisting of a luminometer handheld device, compatible tests and a powerful new software platform, to verify that surfaces have been effectively cleaned in seconds, for better decision making and audit preparedness. Meet the new guardian of the line! When it comes to hygiene monitoring, you’ve got alot on the line and accurate information is critical. But not all systems are the same. Keep things moving with the 3M™ Clean-Trace™ Hygiene Monitoring and Management System, now re-engineered and more reliable. It helps you quickly prepare for and pass your audits. It’s designed to give you peace of mind with improved accuracy and breakthrough technology. It’s go time. The system comes complete with luminometer and software and is used with the 3M™ Clean-Trace™ Surface ATP UXL100, 3M™ Clean-Trace™ Water Plus – Total ATP AQT200 and 3M™ Clean-Trace™ Water – Free ATP AQF100 to determine the level of contamination in a sample. Powerful. Flexible. Indispensable. The redesigned 3M™ Clean-Trace™ Luminometer features improved ease of use, faster time to result, and simple one-handed operation. Its ergonomic design makes testing simple, minimizing training time and costs. And with a higher degree of repeatability and lower variability, you will get accurate results you can count on. The 3M™ Clean-Trace™ Luminometer is supplied with 3M™ Clean-Trace™ Hygiene Monitoring and Management Software with a newly redesigned dashboard for a quick and easy way to create, store and edit reports. The software turns data into information, helping you identify root causes and take action quickly. Now even easier to use and more intuitive, with convenient wireless and networking capabilities. Put your data to work identifying workplace trends, optimizing productivity and adding value to the process. Check out 3M™ Clean-Trace™ LM1 and other hygiene monitoring products here! Use the Surface test UXL100 to sample a small area. Flexible and pre-moistened, the test reaches even difficult-to-reach areas. Activate the test and shake. Place test in Luminometer and measure. “Pass” —the surface area is clean. 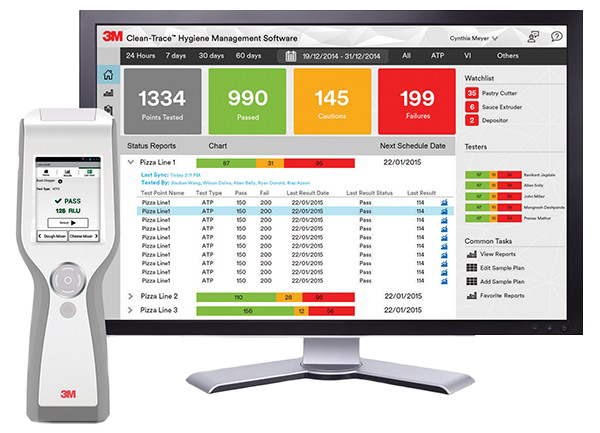 With 3M™ Clean-Trace Hygiene Management Software, you can pinpoint exactly where a sanitation problem occurred and address it.